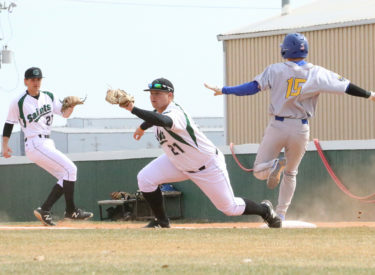 LIBERAL, Kan. – It was a day riddled in errors for the Seward County baseball team (8-5) as they dropped both games against Trinidad State on Sunday, losing game one of their doubleheader 11-2 before losing game two 9-4. Sophomore Ethan Earhart (2-2) started on the mound for the Saints, pitching 4.2 innings in the loss. He gave up three hits and three runs while striking out four batters. Jordan Pepper and Brayden Conner combined for 2.2 innings in relief, giving up 8 runs and 8 hits. The Saints came away with just seven hits on the day, with Cayde Ward, Dylan Paul and Joseph Kuhn each getting two hits. Brendan Madsen came away with the only RBI for the Saints driving in both runs. Trinidad State got on board in the first with a five-pitch inning. A leadoff double on the first pitch put a runner in scoring position. A sacrifice bunt pushed the runner to third on the next pitch before a sacrifice fly on the following pitch scored the run. A foul ball and a fly out ended the five-pitch, one run inning. Seward tied it up in the second. Three singles loaded the bases for the Saints before Madsen walked to bring home the tying run. Cole Bergdall grounded into a fielder’s choice at second base to end the inning with bases loaded. A hit-by-pitch followed by two singles loaded the bases for the Trojans to start the third inning. Another hit-by-pitch scored the lone run of the inning to make it 2-1 in favor of Trinidad State. The Saints got back on board in the bottom of the fourth with a double to left field by Madsen. He drove in Kuhn who reached on a double to centerfield. Once again, however, the Trojans had an answer for the Saints, retaking the lead in the top of the fifth. A hit-by-pitch followed by an error by Earhart put runners at 2nd and 3rd for the Trojans. Trinidad State hit a sac fly to bring home the third run for the Trojans. Trinidad State ran away with it in the 6th inning. With two outs and a runner on first, a double to left field scored the first run of the inning, making it 4-2. Another double by the Trojans made it 5-2, before a single to left field gave the Trojans a four-run lead. The Trojans put the game out of reach to prevent a Saints comeback in the seventh inning. Trinidad led off with a double and an error by Dylan Paul on the next play allowed the first run of the inning to score, making it 7-2. A hit-by-pitch put another runner on base before a single to right field scored the second run of the inning. Another error by Paul advanced the runners to 2nd and 3rd. A sac fly pushed home the 9th run of the game, before a single and double scored the final two runs to make it 11-2. Freshman Tanner King (1-1) started for the Saints in game two, pitching 4.2 innings in the loss. He gave up three hits while striking out four batters. Six Trojans scored while King was on the mound, but only two were earned. West Reddell and Braeden Gould combined for 2.1 innings in relief. The game started off bad for the Saints, as the leadoff batter reached on an error and advanced to third on the throw. A ground out to third base scored the runner to give the Trojans a 1-0 lead. Seward tied the game in the bottom of the first with a sacrifice fly by Dylan Paul, scoring Madsen who reached on a single. The Saints took the lead in the bottom of the second after Cody Coontz singled to left field to score Austin Tidwell. Tidwell reached on a leadoff double to left field before Jose Caraballo flied out to right field to advance Tidwell to third place. The Trojans got back on top in the third inning. Two singled and a double loaded the bases for Trinidad State. A single to center field scored two runs to make it 3-2. Following a scoreless fourth inning, Trinidad State exploded for five runs in the fifth. With two outs and runners on first and third Madsen misplayed a line drive in centerfield, allowing both base runners to cross the plate, while the batter advanced to third. A double to right scored pushed the score to 7-2 before another double to right field make it 8-2 heading into the bottom of the fifth. The Saints made up one run in the bottom of the fifth. An error and a walk put runners at first and second before another error allowed Cole Bergdall to score. A leadoff single and a walk put runners at first and second for the Trojans in the sixth before a fly out to right field advanced the runners to second and third. A single with the next at bat scored the final run of the game for the Trojans, making the score 9-3. Seward played with their backs against the wall in the 7th inning, needing seven runs to win the game. The Saints quickly loaded the bases with a single, walk and error. Jacob Nielsen hit a sacrifice fly to score Bergdall, but a strikeout with the next at-bat ended the game for the Saints, losing 9-4. The Saints will be back at Brent Gould Field tomorrow at noon for another doubleheader against the Trojans.